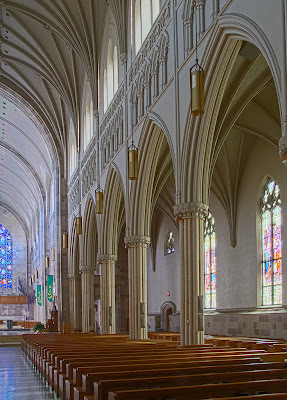 HERE ARE PHOTOS of the Cathedral of Saint Peter, of the Diocese of Belleville, which covers the 28 southernmost counties in Illinois. 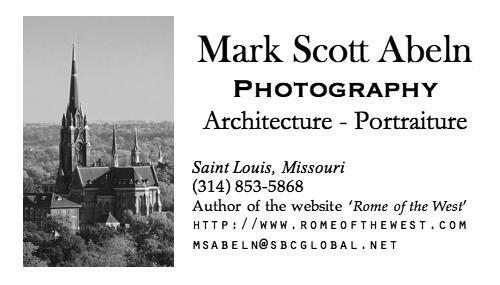 It is located about 20 highway miles southeast of downtown Saint Louis, in Belleville, Illinois; this city is the county seat of Saint Clair County. 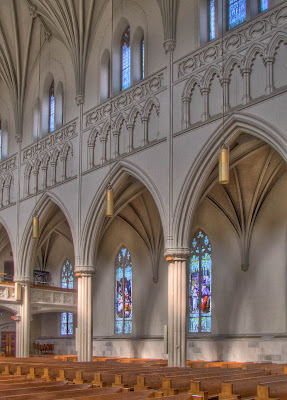 This church dates from 1866, and has been enlarged and dramatically renovated several times. 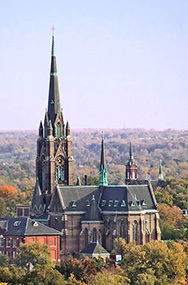 This is the largest cathedral church in Illinois. Click here for more photos of the cathedral. 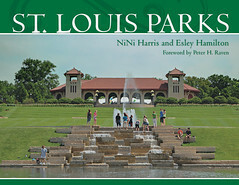 This region was in the Diocese of Saint Louis until 1843; the Diocese of Belleville was erected in 1887. 'Belleville' is French for 'beautiful town', but it does not date from colonial times; rather, it was named by a landowner of Scottish descent in 1814, and much of its current Catholic population descends from Germans who fled the European Revolutions of 1848. The government of Saint Clair County predates the State of Illinois; it was a district of the Northwest Territory, and once spanned two-thirds of the current state. 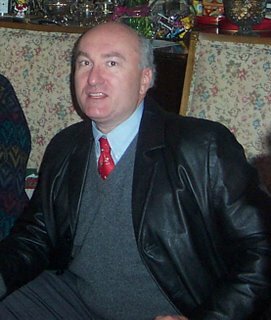 The county is named after Arthur St. Clair, governor of the Territory. 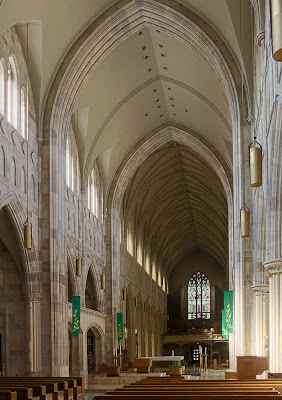 A view down the nave from the newer, south end of the cathedral, constructed in 1966; the modern sanctuary is in the middle. 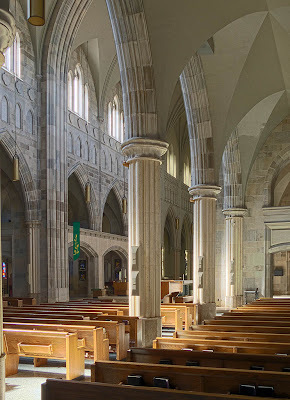 The interior of the church is modeled after Exeter Cathedral in England. 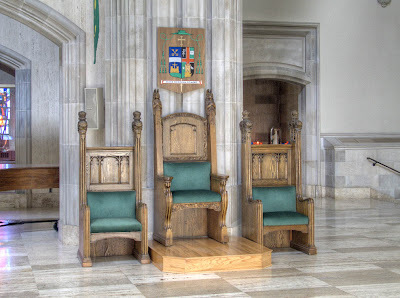 Underneath Bishop Edward Braxton's coat of arms is his cathedra, or chair, which makes this church a cathedral. Ordained a priest of the Archdiocese of Chicago, he was also an auxiliary Bishop of Saint Louis, and Bishop of Lake Charles, Louisiana. 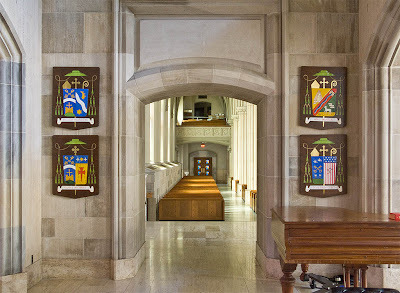 View down the left side-aisle, showing heraldic shields of bishops of the Diocese. 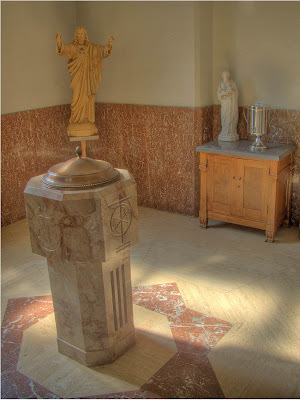 Tabernacle in the Blessed Sacrament Chapel. 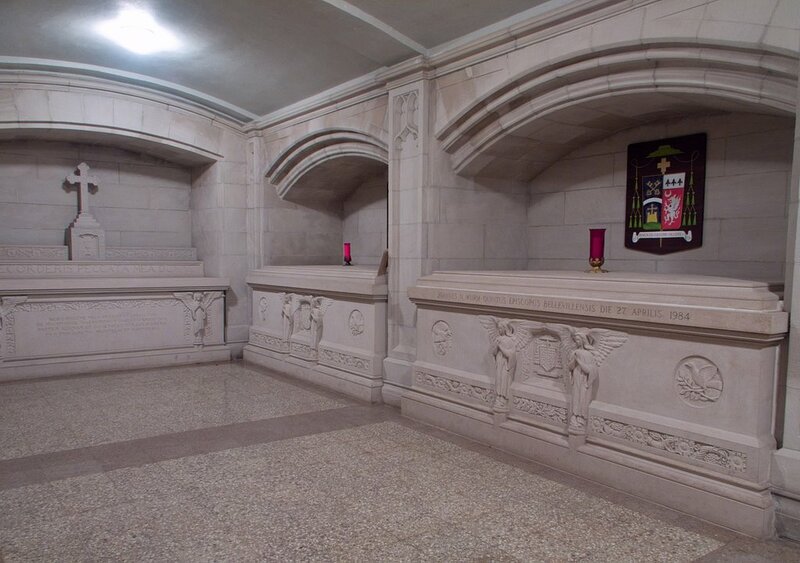 Mass can be offered in here; an altar, not shown, is to the left. The confessionals are also in this room. Two peacocks in the Blessed Sacrament Chapel. 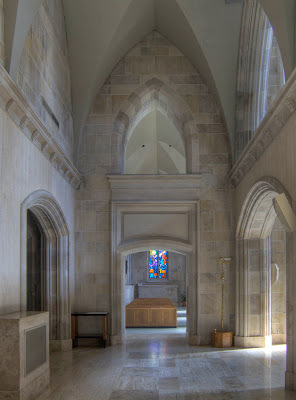 A view up the left side-aisle. 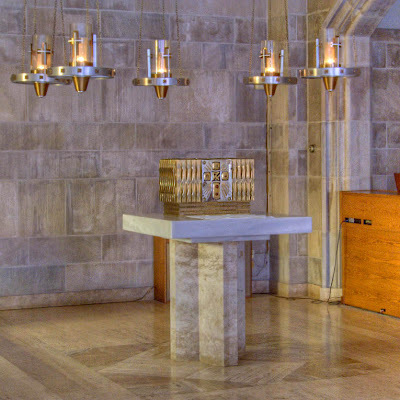 To the left is the Blessed Sacrament Chapel, to the right is the sanctuary. Traditional Catholic statues are painted, and for a long time this was thought to be a Medieval barbarism. However, we now know that even ancient Greek and Roman statues and buildings were brightly colored. Pure, white marble statues are in the modern, and not ancient fashion. Gothic churches were likewise painted with brilliant colors and with gold, on both the inside and out, and so more resembled the Byzantine style, like we find in the interior of the Cathedral in Saint Louis. 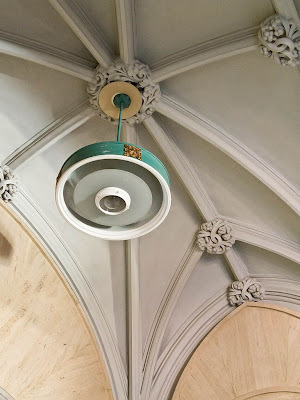 Just imagine the audacity of a Gothic church renovation, done in true Gothic painted fashion! 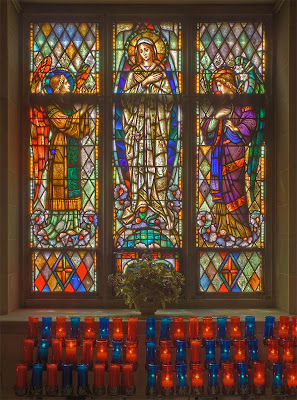 Stained glass window in Our Lady's Chapel illumines the room with a transformed light. 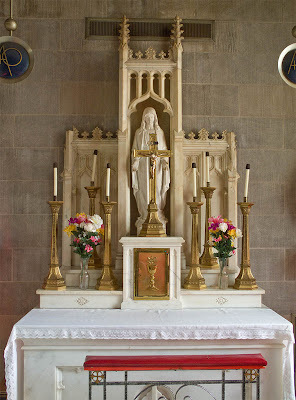 Altar to the Blessed Virgin Mary in Our Lady's Chapel. Stained glass windows on the front door into the church. I'm not sure what all of these symbols mean. 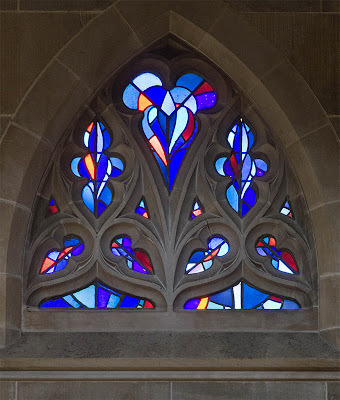 Stained glass windows of the child Jesus teaching at the Temple, and the wedding feast at Cana. Windows in the modern end of the cathedral; the right window shows historical events in the Diocese. 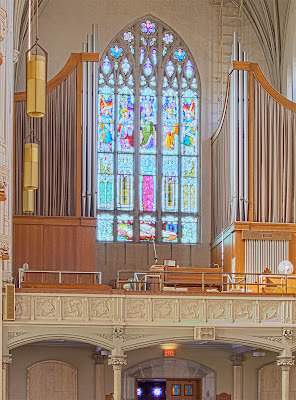 The organ pipes and choir loft. The representation of the window colors here are more accurate than in the previous photo. 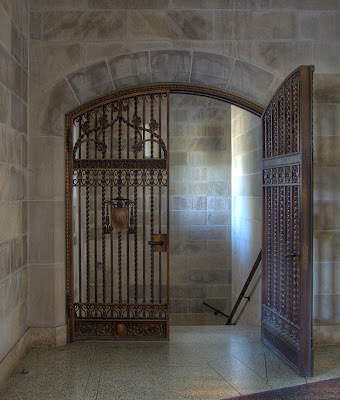 Gate down to the crypt, final resting place of bishops of the Diocese. 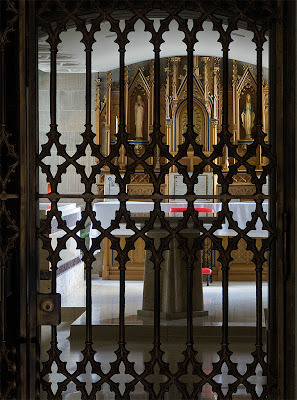 A wrought-iron gate bars the entrance into the chapel-tomb of Bishop Albert Rudolph Zuroweste (1901-1987). A closer view of the traditional altar from between the bars of the gate. In front is a bishop's vesting table. 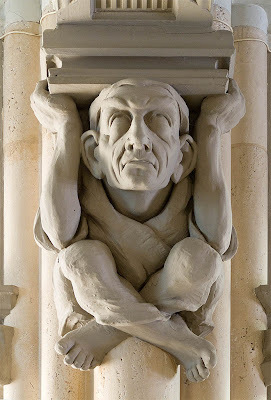 Comical grotesques greet worshipers entering the nave of the church. 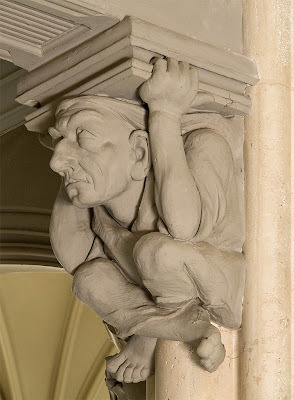 Grotesques usually represent sin and folly, or an especially "beloved" supervisor. Monday - Friday: 6:45 a.m.
Friday: 8:00 a.m., when school is in session. 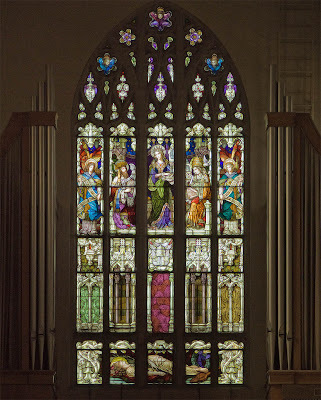 Saturday: 3:00 p.m. - 4:30 p.m.
Great pictures as usual, but you missed showing the almost comical staind glass window at the modern end of the church. It's a window to behold! The small set of windows at the front door appear to be a mix of symbols. A few look like symbols of the Apostles and others, the sacraments. By the way, your website is awesome! It gives some of us a look at churches we would never see. We have many "gems" in the Springfield IL diocese, also. It was a pleasure to meet you in the Cathedral -- and to come to your "rescue"! 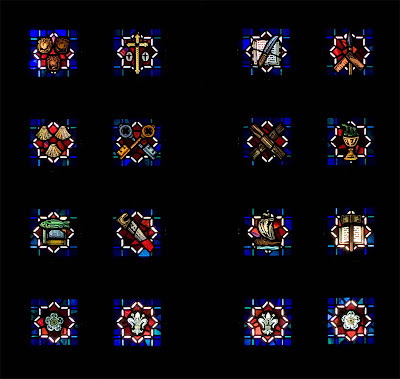 These windows contain the symbols of the apostles. From the inside, beginning in the upper left hand corner, are three bags, a symbol for Matthew, who before becoming an apostle, worked as a tax collector. 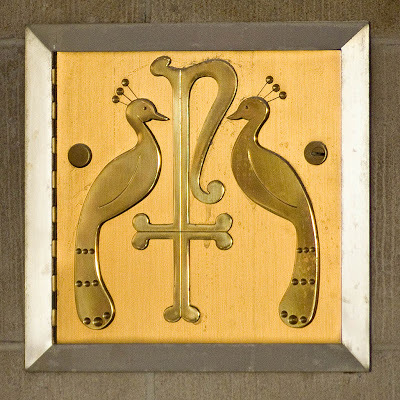 The cross and two loaves represent Phillip because Christ spoke to him regarding the two loaves of bread feeding the multitude. The knife and Bible symbolized Bartholomew who was flayed alive and then crucified. Thomas was depicted as a carpenter's square and spear because he built a church with his own hands, and a spear was the instrument of his martyrdom. The three shells represent James the Greater since he was the first missionary. The keys symbolize Peter for he was given the responsibility of keeper of the kingdom. 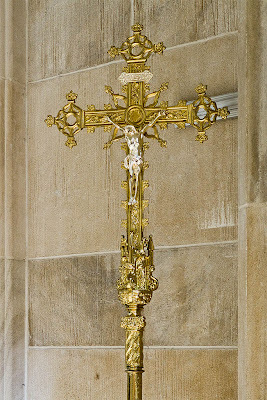 The X shape cross represents the type of cross on which Andrew was crucified. The chalice and snake stand for John, who was offered a poisoned chalice in an attempt on his life. A fish and Bible symbolize Simon, a fisher of humanity, who accompanied Jude on many missionary journeys. A saw represents James the Less who was thrown from a pinnacle, stoned and then sawed in half by the Jews. Jude's missionary activities are symbolized by the ship. An ax superimposed on the open Bible refers to Matthias' being stoned and beheaded. First of all I have to say what an beautifull pictures but it makes me also ask the Question if you are able to tell what of those presented coat of arms, is that of Bishop Albert Rudolph Zuroweste? Unfortunately, I don't know which are his coat of arms. Great photos of the Cathedral. It's Belleville's greatest asset, as far as I'm concerned. As an update, I'd add that the church has added a 5 p.m. Sunday Mass as well. Great photos and stories. I grew up and served mass at the Cathedral for years. 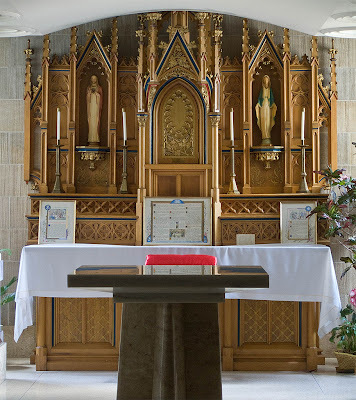 I served Mass in the Blessed Sacrament Chapel every Saturday from the time I was 11 to 18. I also played the organ and took lessons from the choirmaster. Would love to see close up of the organ. 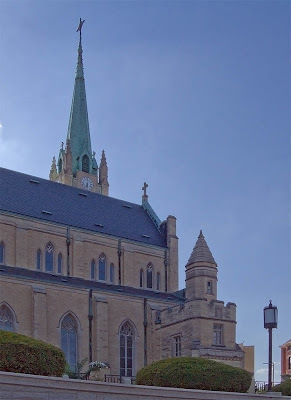 When my wife and I married and moved to St. Louis city, St. Francis de Sales was our parish. I see it in the right hand column ad.